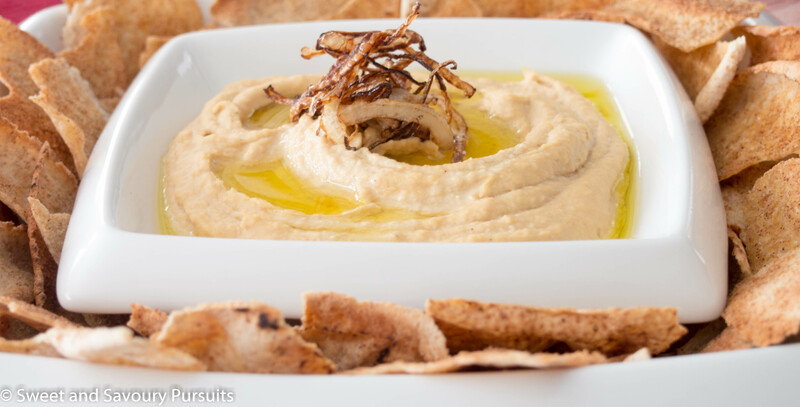 This Caramelized Onion Hummus dip is savoury, creamy and delicious. Serve it with pita chips, tortilla chips or vegetables for a delicious appetizer or snack! Are you planning a Super Bowl party? Or maybe you are attending one and are looking for something to bring. If you are looking for a healthy snack to serve then you will want to try this Caramelized Onion Hummus. This recipe is already party sized so no need to double it. If you want to make a smaller batch then I recommend dividing the ingredients in half. 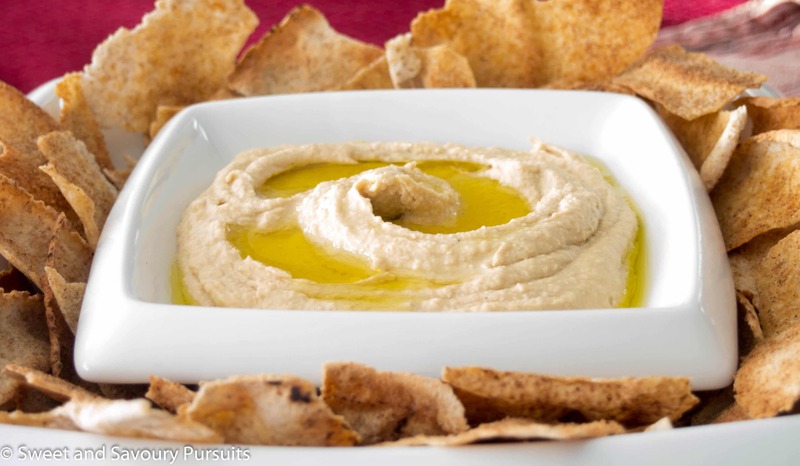 Making hummus at home is so simple to make, takes very little time and tastes so much better. To make this caramelized onion hummus, I started by caramelizing some onions in some olive oil. Once they were nicely caramelized, I added them to the rest of the hummus ingredients and puréed it in my food processor, but you can also use a high powered blender. The caramelized onions added a really nice slightly sweet and mellow flavour to the hummus. If you are looking for more snack ideas, take a look at my posts for Rosemary Spiced Roasted Almonds, and my Sweet and Spicy Mixed Nuts. Or if you’re looking for a simple dessert, this recipe for Cocoa Quinoa Puffs and Peanut Butter Squares is one of my favourites! 3, 14- oz. can chickpeas total 42-oz. Heat 1 Tbs. olive oil in a fry pan on medium-low heat and add the sliced onions. Stir them frequently so that the onions caramelize evenly. Let the onions cool to room temperature. Drain the canned chickpeas reserving some of the liquid and then rinse the chickpeas under cold water. Purée all of the ingredients in a food processor until very smooth, adding the reserved liquid as needed to thin the hummus to a medium-thick paste, if you need to you can use water to thin out the hummus some more. Season with salt, add 3 Tbs extra-virgin olive oil and process again. Transfer the hummus to a shallow bowl, drizzle with more olive oil, and sprinkle with paprika or cayenne (if you want to add some heat!). You can also garnish the hummus with some frizzled onions. Just slice up about half a small onion into thin slices and fry in vegetable oil until brown and crisp. Lay the onions on a paper towel to remove the excess oil and then use as a garnish. Serve with pita bread wedges, toasted pita chips, tortilla chips or raw vegetables. The hummus will keep for about a week. This sounds fantastic!! I have a couple varieties of hummus recipes on my blog including roasted red pepper, but this might have to be my next batch! Thanks Ani! I have to admit I’ve never tried making a roasted red pepper hummus. I’ll check your recipe and give it a try!